Remember last year when I called called cake pops evil? Well pretty much my opinion of them has not differed, I just have a better understanding of how much time and effort those deceptively ratchet balls of cake require.. So once again, my daughter is in charge of bringing in treats for the entire class to celebrate a classmate’s birthday, but this time there was a wrench thrown in ..this kid is loaded with allergies. Easy for someone like me used to doing GF? AH no. 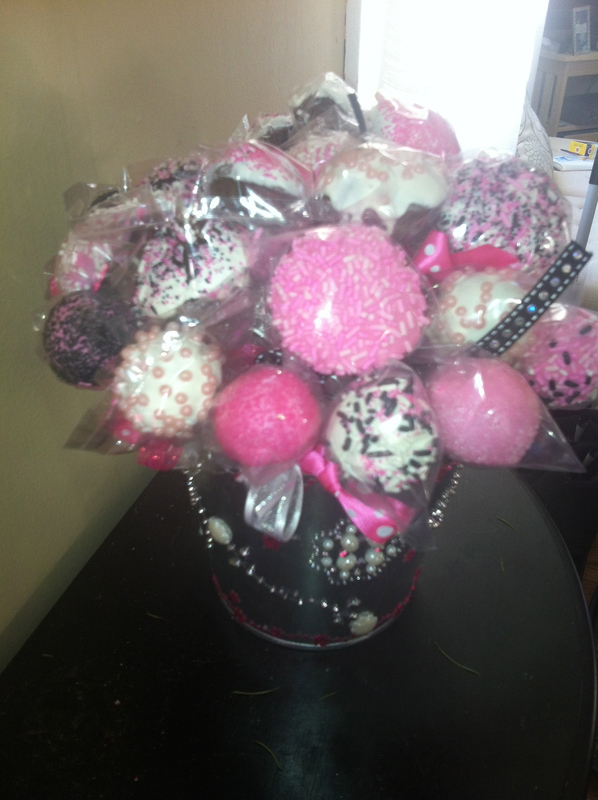 See I had a theme in mind..pink, black and white for a sweet sixteen. I bought out the Wilton section at the craft store, I mean how can colored sugar pose a threat to anyone but diabetics? Yeah…about that..WRONG again. Wilton products in small print on the sides of their products states “processed on equipment that handles nuts, tree nuts and wheat products”…ARE YOU FREAKING KIDDING ME? Even the food coloring was not deemed safe so what to do? Luckily there is a specialty cake decorating shop 2 towns over from where I live and I figured what the heck it would not hurt to check them out. I have not been in this store in years and wondering with all the baking and decorating I do why haven’t I been there? I was in luck that the place was very quiet and the manager was able to chat, the store actually has its own line of sugar, sprinkles and melting chocolate that is packaged in house and nut/gluten free..my rear end saved once again. Like all good things there was always a catch..the color choices are limited, but not so much that I was forced to abandon my color scheme. Really was a swift kick in the pocketbook to buy all the same items again just nut free. The thing with cake pops is they are easy enough to whip up..I made the cake batter, put some of the batter into a mini whoopie pie pan, put the rest into a ziploc bag, snipped a little hole on the end..voila instant squeeze bottle for the cake pop maker and cook your cakes. Once they cool down you really must pop them into the freezer. 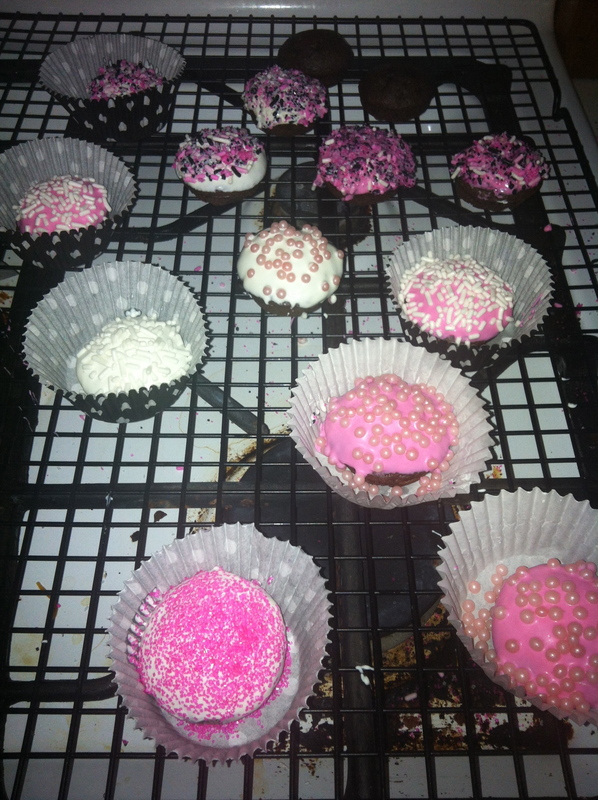 Today I tried both frosting and chocolate melts …and the chocolate melts are much easier to work.